Display this super adorable crocheted chicken family in your living room. It’s the perfect decoration for Easter. In fact, the chicks and chickens are so irresistibly cute you might end up keeping them all year round! Make a set for yourself or give one away as a gift. In fact, intermediate and advanced crocheters will surely enjoy creating this crochet chicken family pattern. It’s the perfect project for Easter. 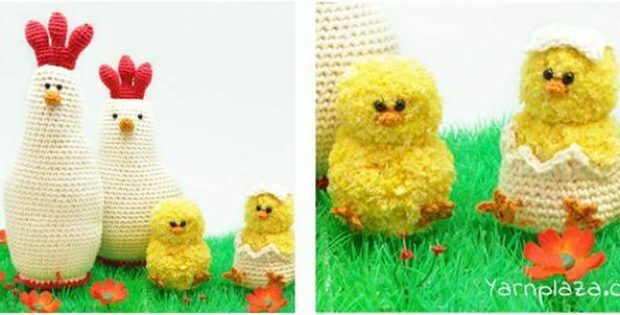 The pattern for this lovable crochet chicken family includes instructions on how to make a thin chicken, a thick one, and two super cute-looking chicks! This amazing crochet chicken family pattern is a wonderful creation by the designers over at Yarnplaza. You can access the pattern for this lovable crocheted chicken family for FREE. Featured image: Yarnplaza – thank you!